Dublin has so many things to see and do which makes it a great city break for anyone. It is very diverse and whatever you’re looking for you will most certainly find. Dublin has cute cafes, irresistible restaurants, fantastic architecture, hopping nightlife and curious culture /histories making it a dream city break. The Riddler is in the vicinity of most of the activities and attractions that Dublin has to offer, making us very lucky to be so central. One of these historical attractions includes the obviously beautiful Saint Patrick’s Cathedral. Learn here about Ireland’s largest church! 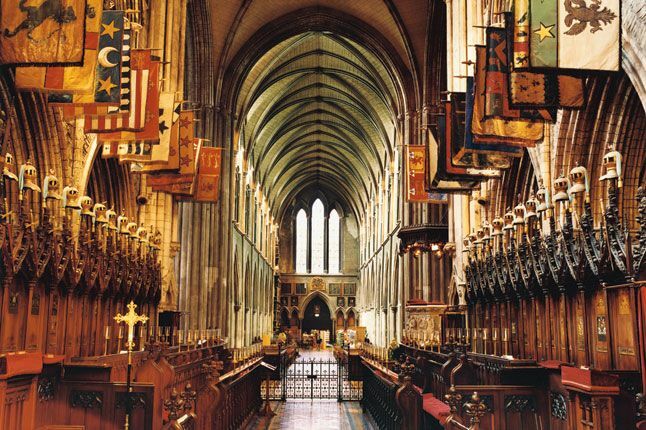 Saint Patrick’s Cathedral is Ireland’s largest church and has seen its fair share of history. The church was built between 1191 and 1270 on the site of an earlier church that had stood here since the 5th century. It was here that St Patrick himself reputedly baptised the local Celtic chieftains, making this bit of ground sacred: the well in question is adjacent to St Patrick’s Park, which was once a slum. The church saw its fair share of storms, rain, and bad weather which required those flying buttresses be added to the design in 1846. By the start of the 19th century the building was again in a sad sorry state. Benjamin Lee Guinness wrote a letter to the board in 1860 offering to bear the total cost of the restoration. However, his sole stipulation was that he be not interfered with by the Cathedral board in this work. Between 1860 and 1865 the Cathedral was closed for massive restoration and repair. Work concentrated on the nave and the transepts. The construction on the site unearthed six Celtic grave slabs which dated back to the10th century. These covered what looked like that of the well Saint Patrick used in the fifth century. The Cathedral has become home to a variety of sculptures, statutes and windows which are all themed around the life of Saint Patrick to honour and remember what he did in the church. The church is open to the public for worship and just to visit as it is one of the most beautiful churches architecturally. Services run on: Sunday (09:15am Holy Eucharist, 11:15am Choral Matins / Eucharist, 3:15pm Choral Evensong), Monday to Friday (9:00am Sung Matins, 11:05am Eucharist Wednesdays and Thursdays only, 5:30pm Choral Evensong) and Saturday (11:05am, Eucharist). 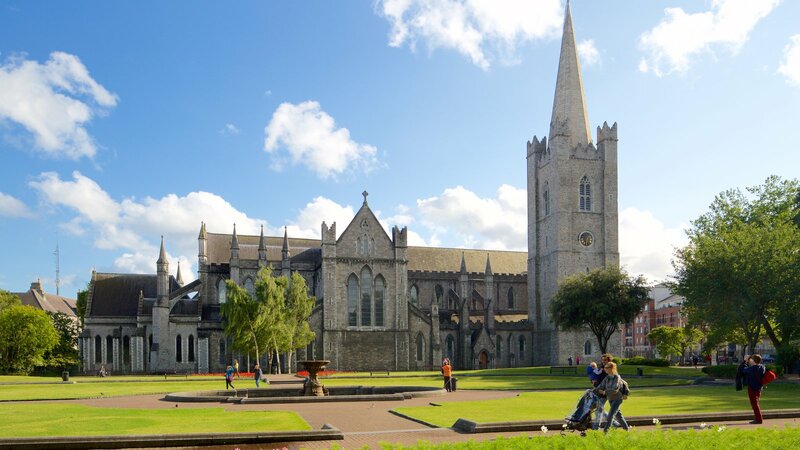 It is located at St Patrick’s Close, Wood Quay, Dublin and is complete with the large church surrounded by a clean colourful green space for a bit of relaxation. At all times of the year you will see people relaxing on the green, listening the fountain bubble and the low hum of the Dublin traffic passing you by. It is a perfect place to kick back with a coffee or have a roam around the park to view the sculptures and the colourful flowers that line the winding walkways.